Coming off the heels of a major hardware announcement earlier this month, Microsoft revealed a smorgasbord of new initiatives aimed at boosting the appeal of its Surface tablets for large enterprises and other organizations such as schools and governments. 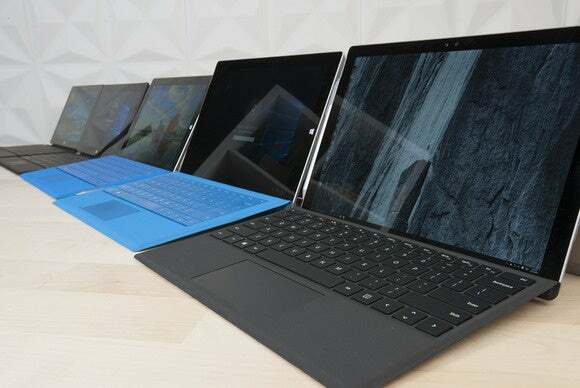 Enterprises that want to purchase a large number of Surface tablets and keyboards for their employees will have a new premium warranty option to choose from: Microsoft Complete for Enterprise. It's a three-year warranty that comes with many of the features people expect from an extended warranty, like coverage for accidental damage. In addition, it also includes a quartet of premium features, including the ability to swap a device under warranty using Next-Day Air in the U.S.
Other services include the ability for companies to hold onto and destroy a small number of devices that can't boot, which is important for government agencies and business users handling sensitive data. Organizations will also be able to pool all of the warranty claims for their Surface devices, rather than being restricted to a certain number of claims per device. That way, if one device stops working multiple times, it can be covered by the pool of total available claims rather than being limited to a few warranty replacements. Finally, the warranty also includes an on-boarding center for training both IT departments on supporting the new devices and new users on how to take advantage of Windows 10 and their new tablets. It seems like an important option for those people who will be seeing Windows 10 for the first time when they're handed a new tablet. Microsoft hasn't revealed pricing for the new warranty, but Cyril Belikoff, a director of marketing for Surface at Microsoft, said in an interview that businesses purchasing a combination of Surface tablets, keyboards and warranties at volume will see a similar price for those devices compared to a similar package with the Microsoft Complete for Business 3-year warranty ordered piecemeal. Microsoft also announced that it has more than 5,000 resellers lined up to sell the Surface to customers in 30 markets. That's particularly important for reaching customers outside of metropolitan areas, organizations that already have existing relationships with resellers and governments that are required to work with local companies for procuring technology. Don't expect Microsoft to announce another 5,000 reseller partners in the near future, though. Belikoff said that the company is happy with the number of resellers it has lined up at the moment and will be focused on working with them. It's not all sunshine and roses for the company's reseller ambitions, either: Lenovo COO Gianfranco Lanci said that the PC maker turned down Microsoft's offer to be a Surface reseller, since the two companies compete in the hardware market. On top of all that news, Microsoft already has 13 organizations lined up to purchase large orders of Surface Pro 4 tablets for various uses. They include Land O' Lakes and Berkshire Hathaway Automotive. The latter will be providing the new tablets to members of its sales force at dealerships around the U.S. It's a sign of significant business interest in Microsoft’s recently-announced tablet, which hasn't even begun to ship.